Last week, we launched our Investor Spotlight series, which is designed to give everyone a closer look at the companies and people that make our economic development work possible. By connecting the dots, these investors give us a better understanding of how San Diego is leading the next wave of global growth. This week, we sat down with Brian Snow, CEO of Pristine Environment, a facility management company that counts some of the world's biggest - and most cutting-edge - companies as its clients. When the world-renowned Venter Institute set out to develop the world's first Net Zero Lab that is also a LEED platinum certified , they called on Pristine Environments and its sustainability team lead by Yann Palmore for help.. With a commitment to sustainability in mind, they collaborate with local companies and organizations, including SDSU and SDG&E, that share similar values. Pristine Environments’ manages, maintains and optimizes the performance of mission critical facilities for corporate real estate owners in nearly 75 Million of specialized buildings throughout North America. From life sciences, aerospace, datacenters, oil & gas, luxury retail, sports technology + fitness and commercial real estate, our team of nearly 1,500 professionals keeps these industries buildings and facilitates operating efficiently, sustainably and on budget. Most recently our building intelligence and energy solutions practice completed the construction of the worlds’ first “Net Zero Energy” laboratory campus in the world. Located in La Jolla, the J. Craig Venter Institute, the world’s leading genomics research organization, developed a new research facility that is the first LEED Platinum building to achieve Net Zero. Remarkably, the building produces more energy than it uses and conserves and collects nearly as much water as it uses. Our facilities’ teams are providing these types of bleeding edge solutions to our clients throughout North America to help dramatically lower their energy and carbon foot print and to create a more intelligent built environment. 2) What are some advantages to doing business in San Diego? As the CEO of the company, I relocated to San Diego last year after having acquired a company located in the region, since our firm at the time did not have a presence in the western states. I had choice to stay working from our main corporate office in Washington DC or relocated to be closer to our new west coast offices. 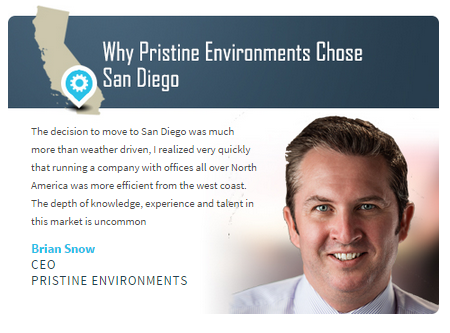 The decision to move to San Diego was much more than weather driven, I realized very quickly that running a company with offices all over North America was more efficient from the west coast. Taking advantage of the time zone difference has allowed me to create a better work life balance for my family, my working colleagues and myself. But now that I have been in San Diego for over a year, I have come to appreciate the depth of knowledge, experience and talent in this market that is uncommon. Most of our national customers have mission critical operations in Southern California and because the demands and regulatory challenges in our state are uniquely complex, being close to our clients and operations, allows me greater insight into the solutions we need to stay competitive nationally. Lankford & Associates has been a prominent real estate developer in San Diego for over 30 years and are responsible for developing a number of well recognized buildings in the region. As the downtown core real estate market has become more of a tourist and business center, Lankford & Associates, has set out to redevelop a portion of downtown called “Makers Quarter” in East Village—the vision, passion and energy for this project has been driven by Stacey Lankford Pennington who has a goal of recreating this part of downtown into a blended mix of hip urban retail, a destination for innovative companies that want the ultimate balance between work, life and urban living. 4) What's in store for Pristine Environments in the next five years? Our company has made a long -term commitment to the region having moved a significant portion of our corporate finance, human resources, and IT operations to San Diego. This includes our CFO and his entire national accounting team along with our COO and Chief Sustainability Officer. We anticipate our investment in the market to continue as we look for additional investment and acquisition opportunities to acquire additional operating companies in the western region of the country. Our client base, which we referenced above, is continuing to grow throughout the region in numerous specialized sectors. Clients like Apple, SDG&E, SDSU and Scripps to name a few, have committed long term strategic capital and other resources to this region—we expect to continue to serve these clients through their growth and benefit from the intellectual capital that our region is so well known for having created.